bDepartment of Diagnostic and Interventional Radiology (C.B., B.H., A.-K.K.-B., J.F. ), University Hospital of Würzburg, Würzburg, Germany. Fat-saturated T1WI scans post–contrast medium application and corresponding scouts optimized for assessment of intradural VWE (C and D), and high-resolution fsT1WI scans to evaluate superficial extracranial vessels (A and B). 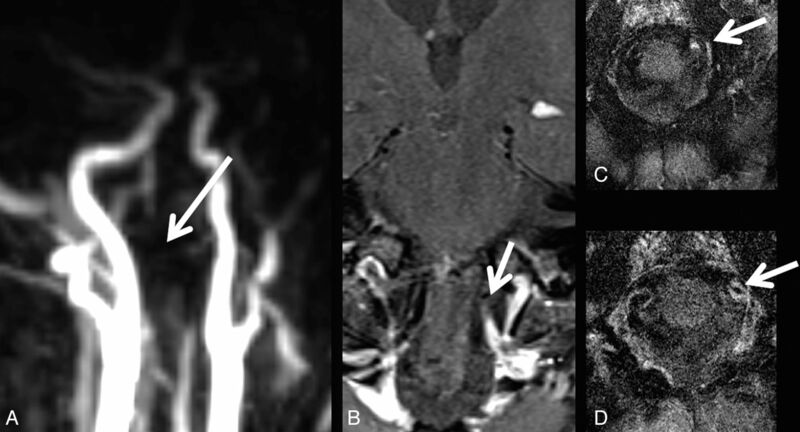 A patient with GCA with vessel wall enhancement of extracranial (A) and intracranial intradural internal carotid arteries (B). In contrast, patient with GCA without VWE of intracranial intradural arteries (C). A patient with GCA with occlusion of the left vertebral artery (A) and corresponding vessel wall enhancement (B–D). Note:—R indicates right; L, left; ROIDS, corticosteroids; NA, not applicable.